Tomorrow is Singapore’s 45th birthday, quite a big occasion here. The word sinha (lion) and pura (city) often occur in the Tipitaka but try as I might I can’t find any reference to Singapore itself. Not being able to link some aspect of the Dhamma to Singapore I have decided to write about another subject that interests me – botany. 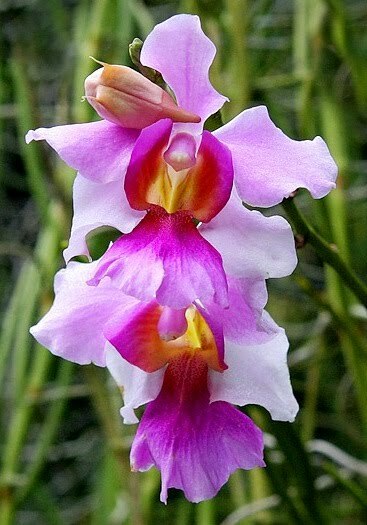 Vanda Miss Joaquim is Singapore’s national flower and apart from being beautiful, it also has a rather interesting story behind it, having been hybridized by a Singaporean Armenian woman in the 19th century. If you ever come to Singapore do visit the National Orchid Garden (I go there often) where you can see Vanda Miss Joaquim as well as some 600 other species and about 1000 hybrids. Anyway, Happy Birthday Singapore. What do they do in Singapore to celebrate a birthday? Please, don't tell me they drink beer and sing "Happy birthday to you..."
Wish You a Happy National Birthday and hope you enjoy the day!